Office Container - OZGE YAPI PREFABRICATED COORP. Containers appear as the most practical solution for construction sites and other office utilizations. Container is a ready-made product, which means your requirement for an office will be satisfied the moment delivery is made and it is put on the ground. It is also used for neighborhood unit buıildings, taxi stations, sales offices, various sales points and suchlike intentions. Monoblock or interlocked container building solutions are also generated in the sizes determined according to the project, apart from our standard sizes of 2,40×6,00 m. The office containers used at the construction sites can be implemented as one, two and three storey. Heat, water and sound insulation are among the most important details in providing the required comfort conditions for the office containers. 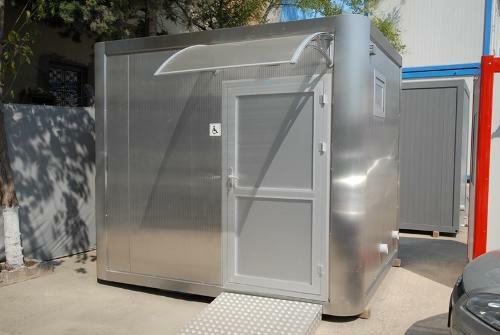 Hekim Panel, Hekim Demountable and Hekim Flat-Pack are the most favored product groups for site office containers. Hekim Classic container is preferred for distinct and boutique offices. A stylish appearance is achieved with decorative fiber cement coating applied on the exterior surface.